The ducks were not there tonight, so it seems the problem is solved! Hoorai! Now I can concentrate on the other troublesome species - the rat! I have started tackling the leftover manure to make a raised bed: I was planning it for potatoes but I had an idea and - since the manure is not full of stones and the bed will be raised from soil level - I could add some sand and use it for carrots, which do not grow well in heavy soils with stones. By the way, I would suggest you never leave a load of manure uncovered: it is taking ages to clean it up from all the weeds that have grown over one year - nettles first in the list, wit vast, branching roots and green, fresh leaves! In the greenhouse, the sunflowers have germinated, and I was surprised to see fleshy leaves emerging from the bed where I planted salad. I thought it might be mint, but then I realised it's the potatoes, the chitted leftovers I found in the shed last winter. How unexpected, I had forgotten about them! Outside, the spinach is out: I had to put my face at the level of the ground to notice, it's so small! It's so good to be able to relax at the allotment after work! That and the fact that British Summer Time is back and I can go to the allotment in the evening after work is cause for rejoicing: EVVIVA! Tonight I planted a chilli that does not seem to be recorded in my database: I was disappointed to find so very few seeds in the packet, but hopefully they will work out. However, the chilli pyramid I planted a while ago has not come out yet. It might be that so far I have only watered the trays once a week, in the weekend, which is very little indeed: if seeds germinated and then dried out, all the peppers, tomatoes and aubergines planted so far may be lost. That sounds like a pretty appalling failure rate: "would I mind more if I had bought fewer seeds?" I asked myself while coming home, after noticing that my neighbour is seriously and frightfully 'professional'... Over the winter he has digged all his half plot, sifted the soil of stones to grow carrot, laid out perfect looking beds and built some impressive polytunnels... luckily I do not feel inclined to get competitive, but I have heard that that things can get really tough with some passionate gardeners!!! More than anything else I enjoy pottering about and mucking in - which by now you should know I mean quite literally! Tonight I found myself singing aloud: isn't that great? That happens very rarely to me... So any edible results are a bonus, I guess. Crop-wise, I still have to plant my extraterrestrial potatoes, or in fact any other potatoes. 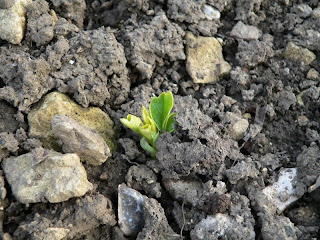 I counted 16 plants of broad beans Aquadulce (overwintering) which is few, especially after the rain of last week, but the Express ones I planted this spring seem to be more successful. I will wait a little bit more then have to consider topping up. In the greenhose, chamomile, having already put out its cotyledons, is now producing tiny leaves, and the minuscule celery seems to have survived so far. Oenothera also looks as if it is coming out. I am still picking leeks from last year: a full bed to go - leeks is most definitely worth to overwinter, easy to grow from seed and reliable. The opium poppies seed I scattered at the back of the shed have come out, while daffodils around the pond and shed look battered (unlike the ones in front of the greenhouse - in the picture above, with guardian sheep in the background). There is sign of rat activity... however, my trap is still there, empty. This week it has been raining and next week it's BST: the perfect situation, it would seem. I am so keen to go and see whether the spinach is out, and more broadbeans. Did I say that I also experimented with old onions, the ones that put out leaves: I have tried to plant them to see if they make new onions or do just flower, which would not be bad either. I am at home now and the sun is coming out: I should probably go and water the seedlings in the greenhouse sometimes this afternoon - feel sleepy and have a lot to study, though. Crop updates, wildlife and manure. There were three in fact, and they start to be a few too many all considered. And although surely any nibbling from the ducks is nothing compared to the devastation made by pigeons, rats and slugs, I have spent all my time at the allotment fencing off the pond and covering it with netting so that ducks cannot access it but frogs can. I would not want to receive a letter asking me to earth up the pond after all the work that went into it. As the ducks came back, the fencing seemed to work: they looked questioningly around and then at each other without attempting any breaking in, before I shooshed them away again - btw, they flew to the other end of the site, where they used to stand in the puddles of water that collected on plastic sheeting. As the neighbour remarked: not very smart animals, you would think the canal and streams in town would make them more than happy. I agree. I uncovered the herbs patch, and all of them were ok except one. Very few broadbeans were out though: I will have to see if they come out next week, given that it should rain, otherwise I need to top up with new seeds. Onions are starting to put leaves out but no sight of asparagus yet. Two artichokes seem to have survived but I am afraid the vines are really dead. Daffodils are out and lovely green leaves are starting to appear on gooseberries, including the cuttings. Rhubarb has mad enormous buds and two leaves. Not my best day at the allotment, especially for a birthday. The other weekend I went very quickly to the allotment and the broadbeans were out!